Very cool overall shape - simple & elegant. I'm a sucker for white tudor-style walls too. Nice use of the minifigures' stands for the roofing; I don't know if I've seen that before. Welcome to Classic Castle. That's pretty nice!! the inn is awesome!! and the figs are too! Very nice! So simple yet, So great! Quite nice, great job on the mottling of the stone wall! The scale of this building is very nice. I like the "log" upper part. It adds a lot of nice contrast, as does the beam above the stables. Good accents w/ the pearl gold as well, and the irregular shape of the base is nice. 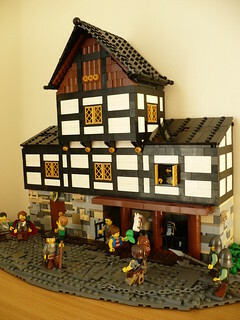 The Flowers of Time wrote: Nice use of the minifigures' stands for the roofing; I don't know if I've seen that before.